World War Z economics: Macroeconomic lessons from the zombie apocalypse. 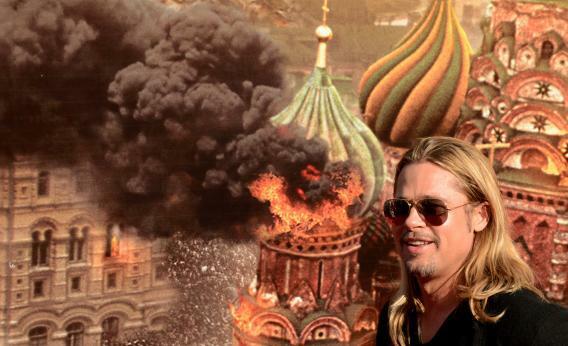 Brad Pitt promoting World War Z in Moscow, June 20, 2013. Without wanting to offer too many spoilers, the new film World War Z portrays a zombie apocalpyse and efforts by world governments to fight against it. The war is, naturally, a total war. And, like any serious contemplation of a total war scenario, it illustrates some important points about economics that tend to get lost in a lot of workaday discussion. For example, socialism beats capitalism in terms of organizing efficient production. The problem with planned economies isn’t so much that they “don’t work” as that they require a high level of political consensus about what you want to achieve. In the event of a zombie apocalypse or an attempted Nazi conquest of Europe, this is pretty easy. And indeed, the Soviet Union was very good at things like building subways and launching things into outer space. The problem is that absent an imminent disaster, this kind of consensus is not going to be forthcoming and it’s much better to let markets aggregate the diverse preferences of a broad population than to try to have everyone reach a collective decision about what color pants people should be wearing or about whether a Doritos taco or a Fritos burrito is more delicious. On the other hand, socialism is not particularly egalitarian. Allocating resources through a political process rather than a market exchange process doesn’t equalize the resources available; it means that resources are allocated according to political clout. The emerging society of naval flotillas and refugee camps is very much not a classless utopia—it’s a place where your living standards are determined by your political clout and perceived usefulness to the powers that be. Last but by no means least, money is irrelevant. A society on a total war footing is not a society that’s free of resource constraints. On the contrary, binding resource constraints are crucial. There is only so much jet fuel, only so many bullets, only so many trained virologists, only so much food, and so forth. But one constraint that never binds is lack of money. In fact, due to the digitization of banking and then the zombie-induced collapse of the global communications grid, it appears that nobody has any financial resources at all. But such state authorities that manage to function don’t fail to mobilize resources due to a perceived lack of money. They simply mobilize the resources by fiat. Historically speaking, nation states committed to a capitalist ideology have tended to maintain a skein of monetary transactions even during wartime emergencies. But these transactions take place against a backdrop of rationing, quasi-coerced loans (“war bonds”), suspensions of gold convertibility, and of course conscription of soldiers.